I got my Bionaire from Petiatric Supply and it works great. It's nice to have a digital device that that lets you check the temperature and humidity in one glance. 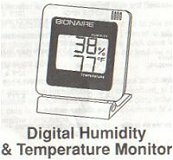 This is much better than those tiny hard to read thermometers, plus you don't need to buy anything separate to measure humidity. Best of all, mine has been running on the same battery for 3 years now. The only problem is that the velcro they give you to attach the device to the brooder/incubator wall doesn't hold the thing up worth beans. I haven't used these toys personally but I've visited the site and looked at them and they appear perfectly safe. These toys are veterinarian approved and come with a money back guarantee if you're not 100% satisfied. They are also made using safe coloring and natural products like vine and coconut. I always prefer natural toys to expensive arcylic ones because they can be destroyed (that's what toys are for you know). These are also moderately priced. I found this site through Companion Parrot Quarterly and spent about an hour browsing it for Christmas presents for my goffin Loki. They have a huge variety of toys and I had trouble deciding on what to get! The prices were very reasonable too. Their toy parts are just as varied and well-priced as the toys themselves, and in the end I bought one big toy and a large quantity of toy parts. My order came quickly and without any hassles (unlike some other things I ordered this Christmas) and even came with a free notepad! This company certainly earns my seal of approval.